Product prices and availability are accurate as of 2019-04-03 04:31:45 EDT and are subject to change. Any price and availability information displayed on http://www.amazon.com/ at the time of purchase will apply to the purchase of this product. 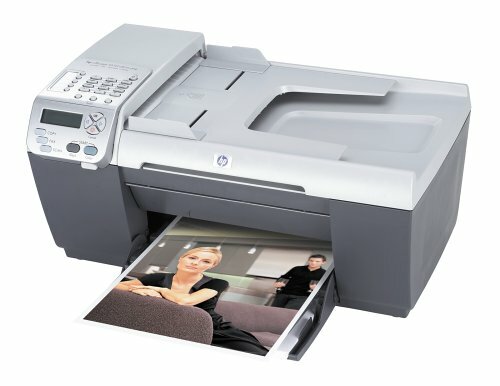 HP's OfficeJet 5510 is an all-in-one color printer, color copier, color scanner, and color fax machine. This versatile unit is perfect for the home office or small business where space is at a premium. With HP's thermal inkjet print technology, resolutions for both black and color prints are as high as 1,200 x 1,200, with 4,800 x 1,200 optimized dpi color printing. Print speeds clock in at 17 ppm for black and 12 ppm for color (maximum, draft mode; actual speeds will vary). The 5510 has a standard input capacity of 100 sheets and up to 10 envelopes, with an output capacity of 25 sheets. It accepts a wide variety of originals, including paper (plain, inkjet, photo), envelopes, transparencies, labels, cards, HP premium media, and iron-on transfers. Supported sizes range from 3 by 5 to 8.5 by 14 inches (using the 20 sheet automatic document feeder). Amazon.com Product Description HP's OfficeJet 5510 is an all-in-one color printer, color copier, color scanner, and color fax machine. This versatile unit is perfect for the home office or small business where space is at a premium. With HP's thermal inkjet print technology, resolutions for both black and color prints are as high as 1,200 x 1,200, with 4,800 x 1,200 optimized dpi color printing. Print speeds clock in at 17 ppm for black and 12 ppm for color (maximum, draft mode; actual speeds will vary). The 5510 has a standard input capacity of 100 sheets and up to 10 envelopes, with an output capacity of 25 sheets. It accepts a wide variety of originals, including paper (plain, inkjet, photo), envelopes, transparencies, labels, cards, HP premium media, and iron-on transfers. Supported sizes range from 3 by 5 to 8.5 by 14 inches (using the 20 sheet automatic document feeder). Access features and common tasks through the easy-to-navigate HP Director software. Depending on the capabilities of your HP all-in-one, the HP Director lets you initiate device functions such as scanning, copying, faxing, or unloading images from a digital camera or memory card. You can also use the HP Director to open the HP Gallery to view, modify, and manage the images on your computer. Status: use this feature to display the current status of your HP OfficeJet. Settings: use this feature to view or change various settings for your HP OfficeJet, such as print, scan, copy, or fax. Select Device: use this feature to select the device you want to use from the list of installed HP devices. Help: use this feature to access the HP Photo & Imaging Help, which provides software help, a product tour, troubleshooting information for your HP OfficeJet, and HP OfficeJet product-specific help. Scan Picture: use this feature to scan an image and display it in the HP Photo & Imaging Gallery. Scan Document: use this feature to scan text and display it in the selected text editing software program. Send a Fax: use this feature to open the fax dialog box so you can enter the appropriate information and then send your fax. Make Copies: use this feature to display the Copy dialog box where you can select the copy quality, number of copies, color, size, and then start a copy. HP Gallery: use this feature to display the HP Photo & Imaging Gallery, where you can view and edit images, print photos in multiple sizes, make and print a photo album, share images through e-mail or a web site, or make a multimedia CD. Creative Ideas: use this feature to learn about creative ways to use your HP OfficeJet. Software Update: use this feature to check for software updates for your HP OfficeJet. Click this arrow to display tool tips that explain each of the HP Director options. Your features may vary. The HP Director is customized based upon the HP device that is selected. If your device is not equipped with a particular feature, then the icon for that feature will not display in the HP Director on your computer. The flatbed scanner provides up to 600 x 2,400 dpi optical resolution and 36-bit color, with software-enhanced resolution up to 19,200 dpi. The 33.6 Kbps modem fax machine has a 3-second per page transmission speed and is capable of color faxing. A 90-page fax memory ensures that your don't miss important faxes when you run out of paper, while fax auto-redial, delayed sending, and auto-reduction provide added convenience. Copy speeds are as fast as 17 cpm for black and 12 cpm for color, while up to 99 copies can be made at once, freeing up your time for other tasks. The 5510 connects via a USB port. Compatible with both Mac and PC, it also comes backed by a one-year limited warranty.